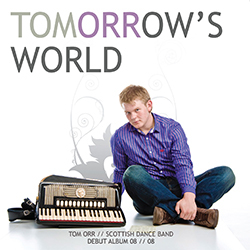 Tom Orr is one of the brightest and leading exponents of Scottish Dance Band music presenting a youthful approach to an idiom that is steeped in tradition. Tom Orr is a musician that pushes the boundaries, challenging his team to explore alternative influences. The outcome speaks for itself and the technique and musicality of the musicians has created a lively, diverse, innovative, unique sound. 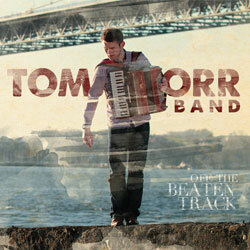 His latest album, ‘Off the Beaten Track’ presents the band at their very best. Recorded in the Borders, in a relaxed environment, the individual characters within the band flourished, capturing something special. The album is packed with tunes arranged and played in a fashion unique to The Tom Orr Band. Variety is the name of the game here, with tracks ranging from vintage pipe tunes to hot-off-the-press compositions, duets and adventurous reels, all of which demonstrate the wide capabilities of a traditional 6 piece line up played at its very best. “Off The Beaten Track” will certainly take you to a new place. Two accordions, fiddle, piano, drums and bass…..the perfect combination for “Off The Beaten Track” ! Here are some samples from the new album.